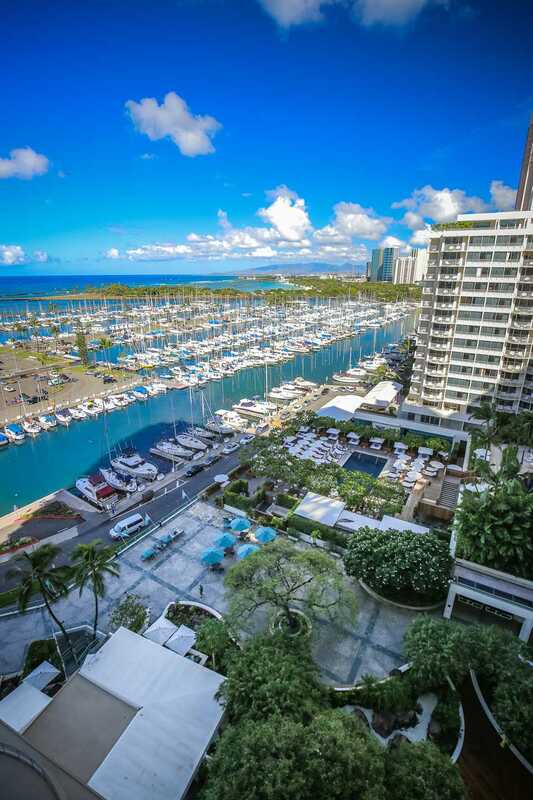 Stunning Ocean Views at Waikiki Bch. Fully equipped and very clean. AC, cable, WIFI, Long Distance, 24/7 Security, Keyless Entry. No Check In required. 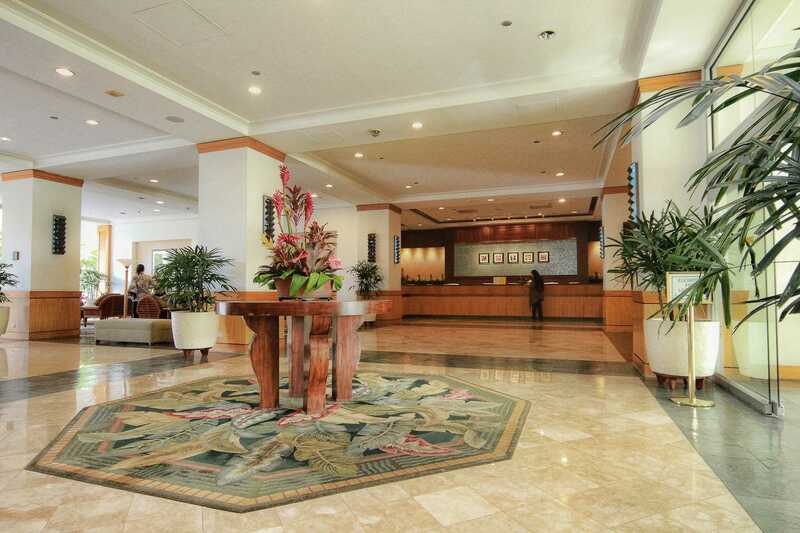 Condo is professionally managed and maintained. The view is fantastic. We had no issues with the property and would seriously consider staying here. Awesome place with even more awesome views. Very clean and well maintained. 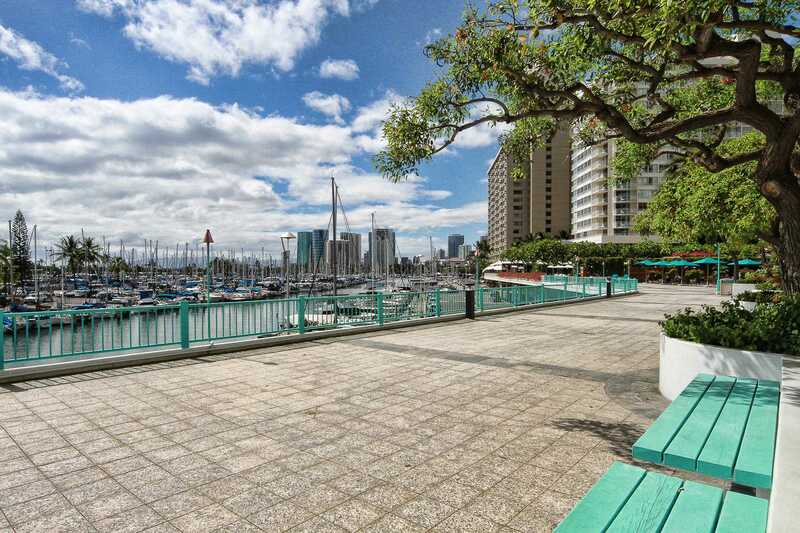 The people were friendly and it is centrally located around tons of great restaurants. Great view from the room and easy to check in. Overall satisfied but since we had a baby together it was scary to sleep on the really tall bed. Included in our quotes, we offer a complimentary pack and play for our Guests with babys. We were not contacted before or during the Guest's stay about any concerns. Great little place, with a fantastic view, and so many awsome beach supplies! The property was how it was advertised. Overall it was clean and except for the coffee maker, could be updated. 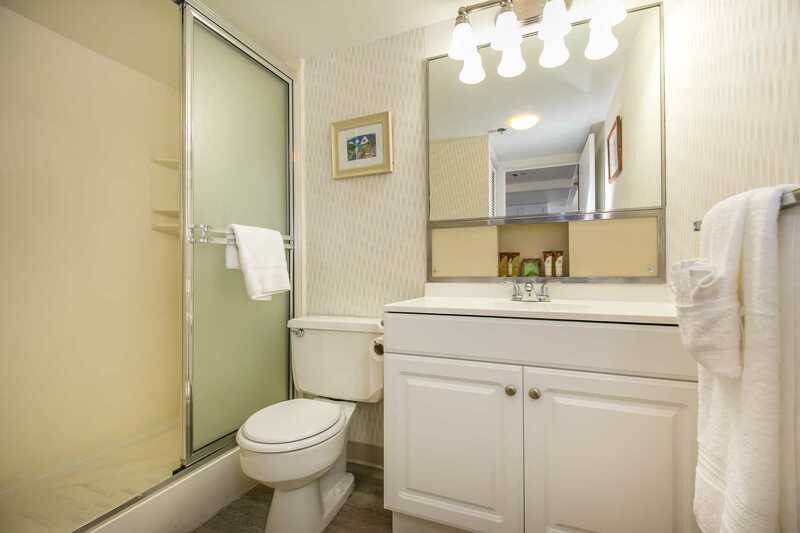 The shower stall was slightly stained and could be updated as well. The view was awesome, bed was very comfortable. Liked that is was wood floor instead of carpet. I would stay there again. Beautiful view, the room was gorgeous. Thankfully we got exactly what was advertised! 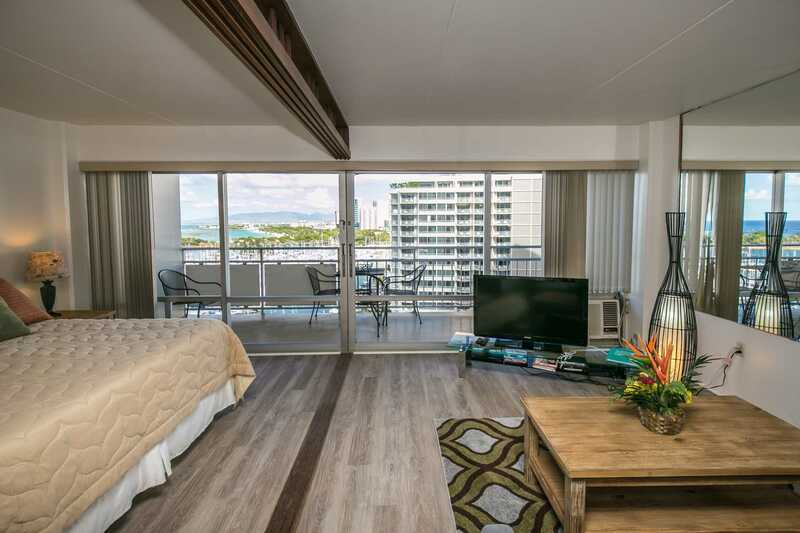 On the days we were in the room and in the evenings, we were able to relax on the lanai or watch tv (which had access to stations just as if you were home). The kitchen was fully stocked, the bathroom could've used a few extra towels/rags but it was fine. The only issue I had was the ac, couldn't figure out how to keep the room cold or at least a comfortable temp. It ended up making the linen on the bed feel a little damp and muggy. That was a minor issue, other than that it was beautiful. Effortless check in/check out, the itinerary we received in the email was very detailed. Great property!! 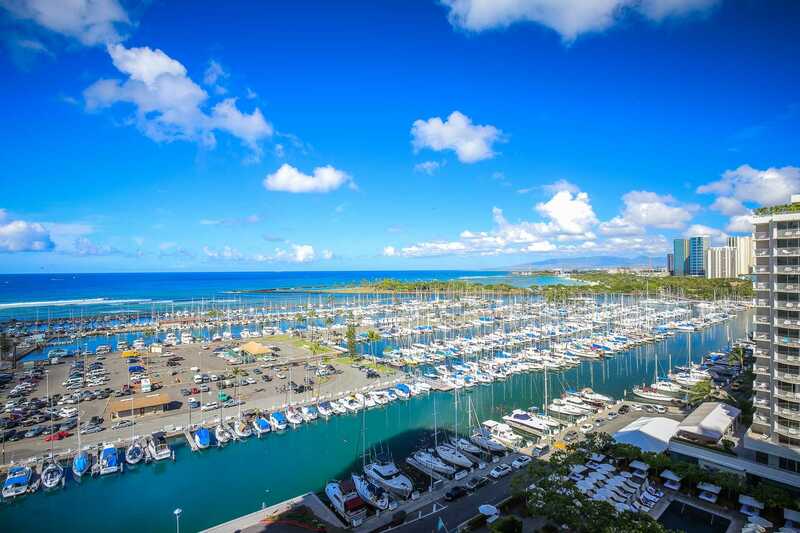 We flew into Honolulu at 6am and when we arrived at the apartment getting in was a breeze. 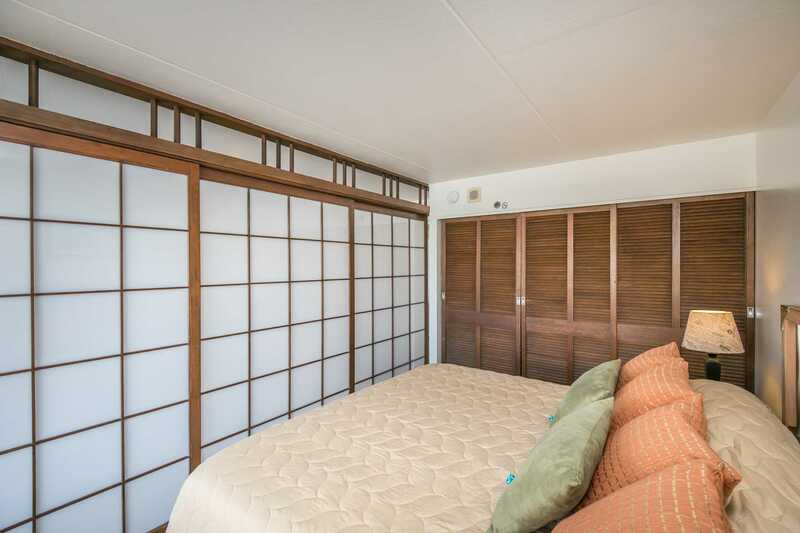 Greater with a spacious layout and comfy bed. The views in the photo don't do it justice, every morning breakfast was enjoyed on the balcony watching the morning surfers catching a wave, then evenings spent watching the sunset. Bed was super comfy and big, bathroom equally as cost. Downstairs has a few shops and cafes which is very handy and also the bus stops directly outside to make it easy to get around. We would definitely stay here again. Wonderful,clean apartment.It has a beautiful view and is in a great location.We were very happy and comfortable.Great-stay Thank you. The condo was excellent and really enjoyed our stay. 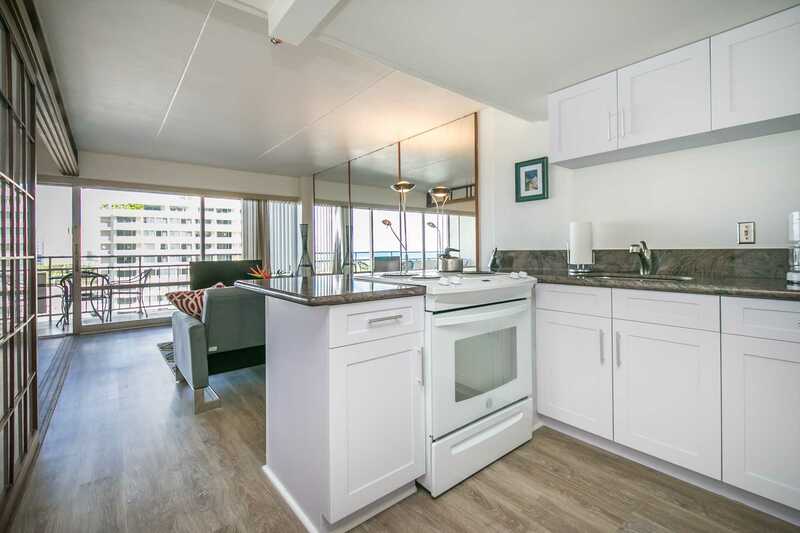 First time staying in Illakai and 4th visit to Honolulu. Condo was better then expected. 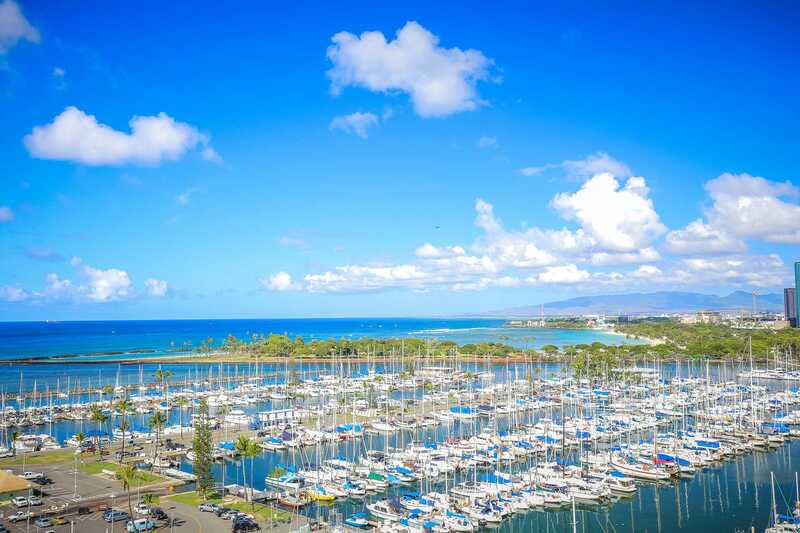 Views over looking Marina, Ala Moana park all the way down to airport plus sunsets each day were amazing. Condo was spacious, clean including 1 bedroom, king bed, comfy lounge, air con and stand alone fan. Kitchen had all appliances that we have at home, so we were able to cook meals within the condo. 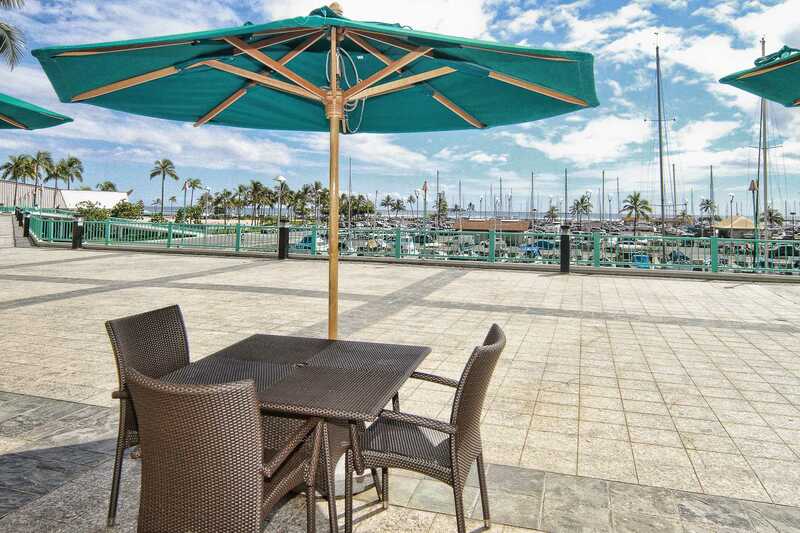 Short walk to Ala Moana shopping centre, beaches and into Waikiki. 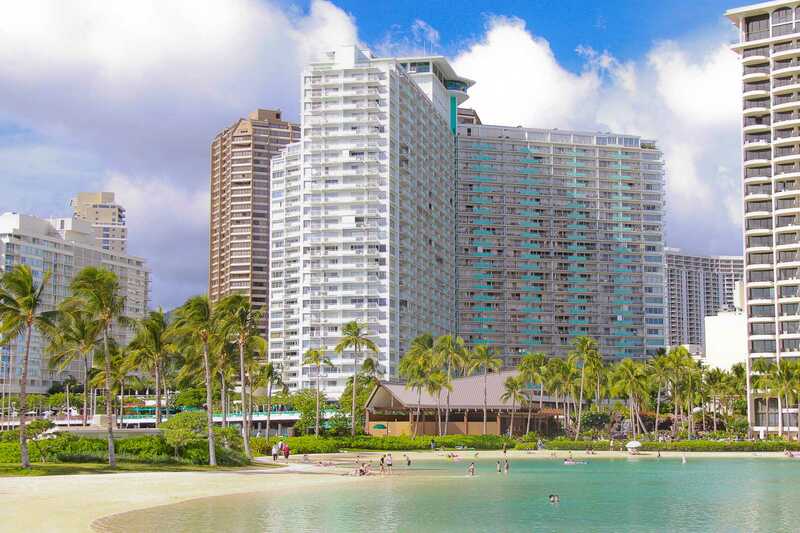 When we return to Honolulu we will be looking to stay here again. The apartment was a perfect size for a couple. 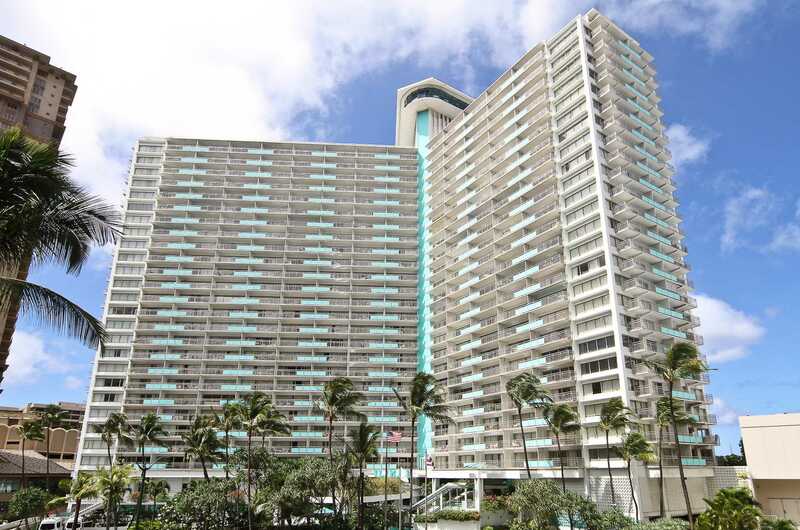 The location was excellent, easy walking distance to the beach, shopping and restaurants. Kitchen facilities were great. The self check in was really easy. Great location and apartment. Although the owners of this apartment are using AirBnB as a letting portal only, we enjoyed our stay here. Pluses: location, amenities, cleanliness, outdoor spaces. Well appointed apartment, delivered as described. Unfortunately because we didn't meet or get the opportunity to engage with the owners none of the local conversations/knowledge transfer that Airbnb is famous for occurred. 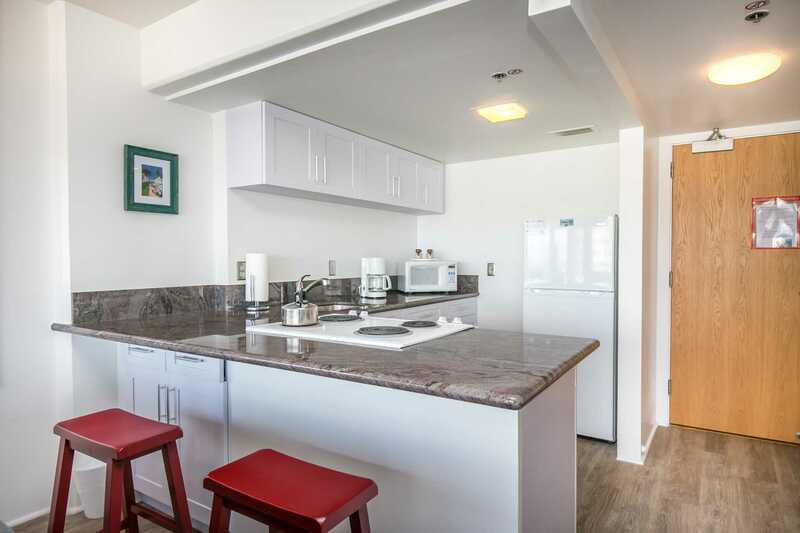 We include our contact information in the condo instructions, refrigerator magnet, business card and info sheet left in left in the condos. Should a Guest wish to engage for any reason, we welcome them to call or email. A wonderful place for a family of three to spend a week! 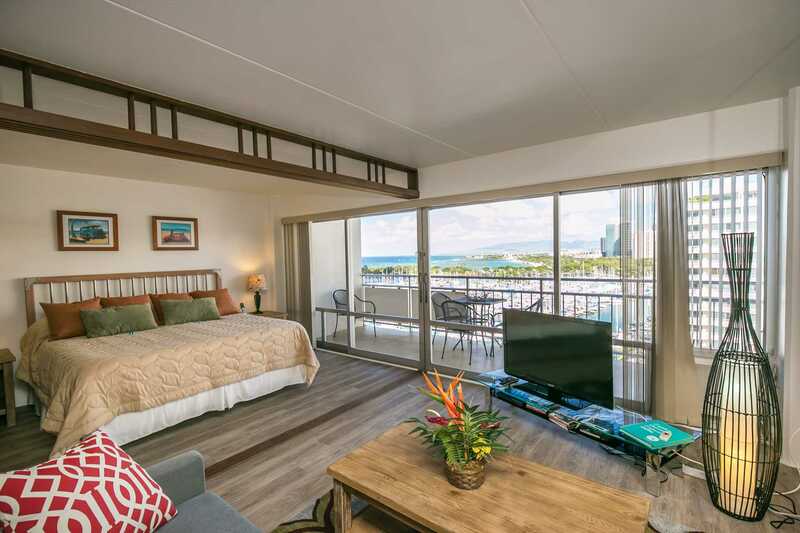 The condo gives you access to two pools at the Ilikai, you're right next door to the lagoon and a family beach & within walking distance of a number of wonderful places to eat. Great value. Excellent view of the boat habour. 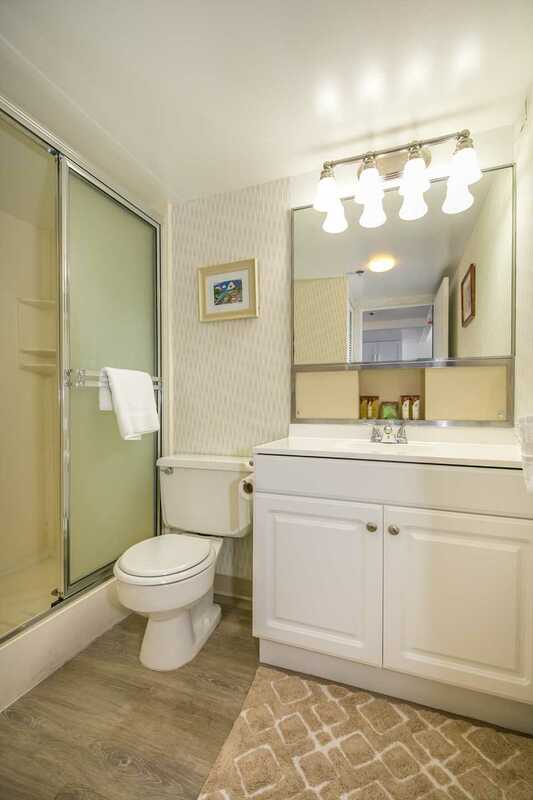 The condo was clean and very well furnished. 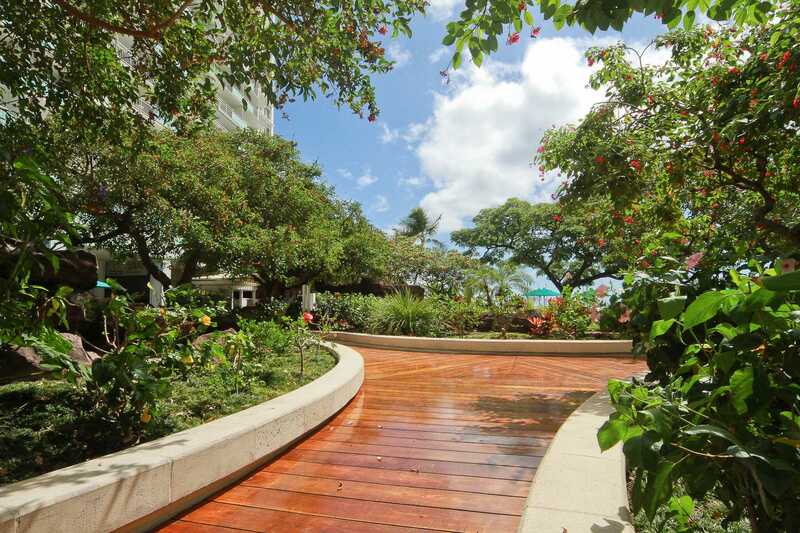 Close to stores, restaurants, beaches. 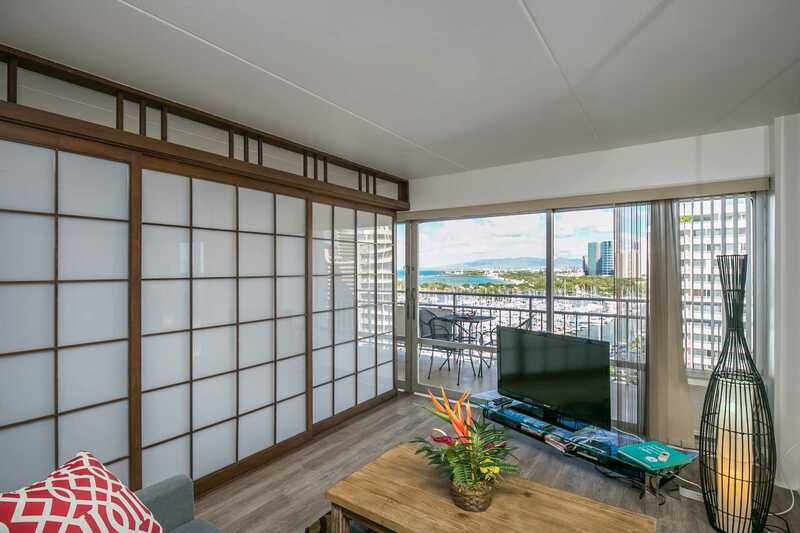 Nice, well-maintained condo with a beautiful view of the marina which turned out to be the PERFECT place to watch the 4th of July Fireworks at Ala Moana Park. Had a great time. Thank you! We stayed April 21 - 24, The condo has all the necessary commodities and more. We had a wonderful view on the marina and beautiful sunsets. Nicely located. 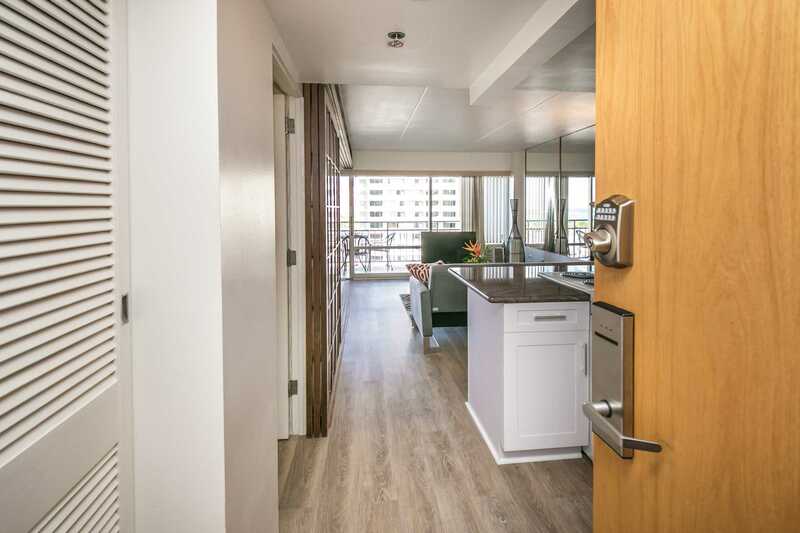 One suggestion is that this condo would accommodate comfortably 3 adults because of the sofa bed which is very nice but very small. Apart from that everything was great!. Mahalo!! 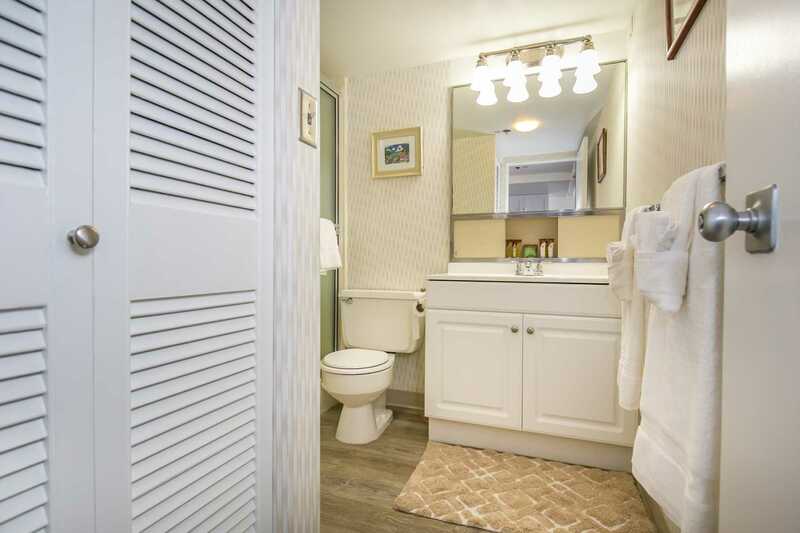 The photos are a very good representation of the condo. Everything was clean and well cared for.The kitchen could have used a couple more pans but other than that, it was terrific. 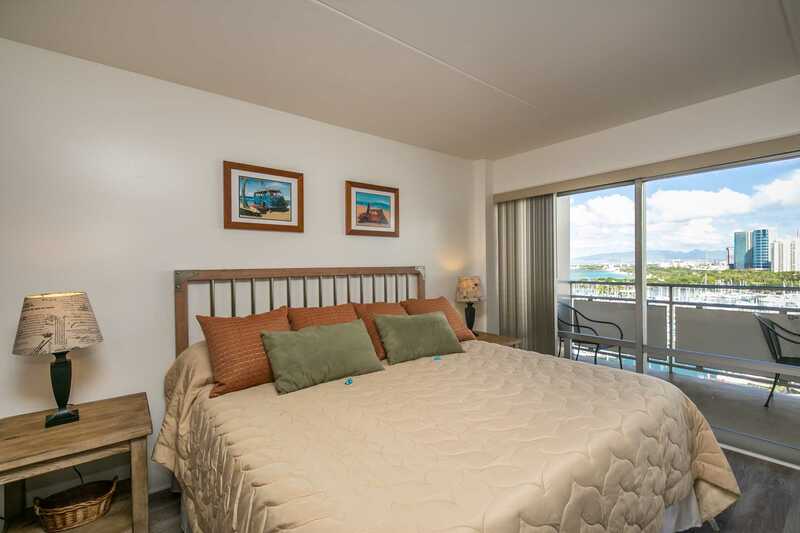 The Ilikai is wonderfully situated, easy walking distance to everything you would want to get to. Great location. 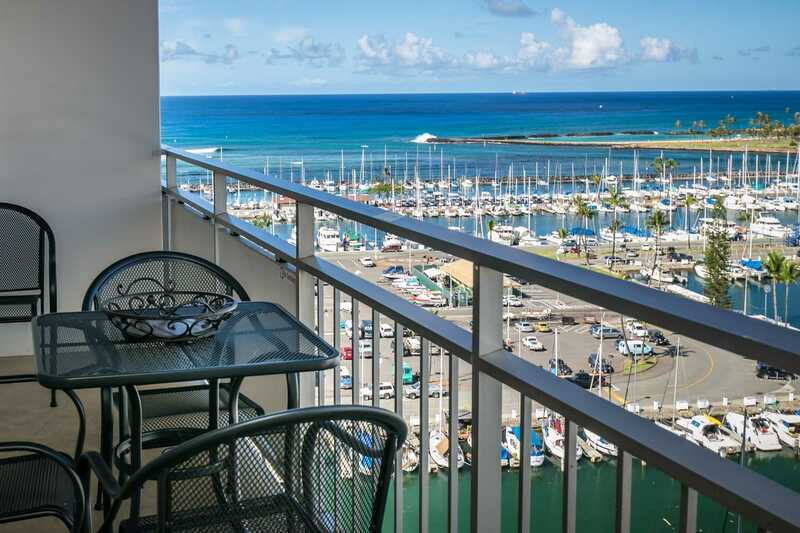 Our unit had the same view as shown on the title webpage for Hawaii Vacation Properties (overlooking the marina to Magic Island / Ala Moana Park. Easy walking distance to Food Pantry (larger grocery store). 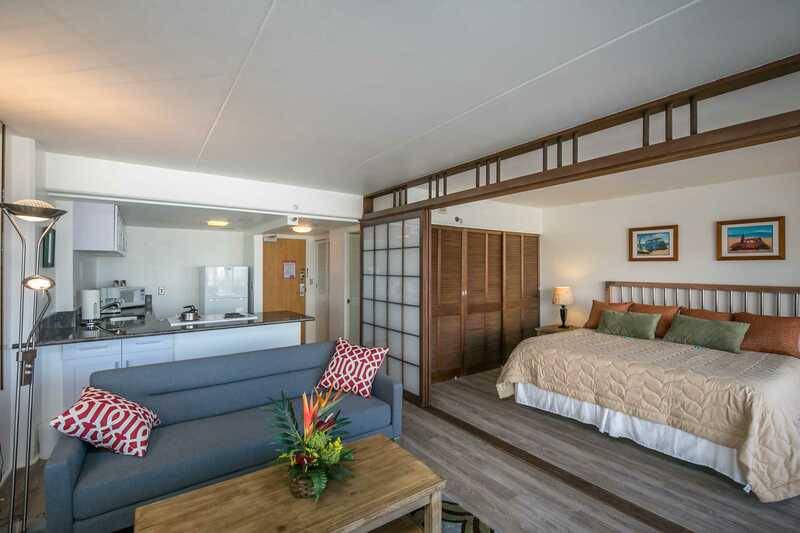 We have stayed in the Ilikai many times in the past so the suite set up was as expected (great room, full kitchen, bathroom and closets, lanai). Nicely decorated, great television and wifi worked well. Fully equipped kitchen. Enough bath towels and two beach towels. Starter soap, shampoo/conditioner, dishwashing liquid, sponge, paper towels also included. Our unit had nice beach equipment (straw beach mats, boogie board, float, two low beach chairs) which I believe were left by previous guests - no one would carry that home on a plane. Unit was very clean and the keyless entry was terrific. On check out day, we stored luggage with the hotel doormen at ground floor in a secured area very inexpensively as our flight did not leave until the evening. 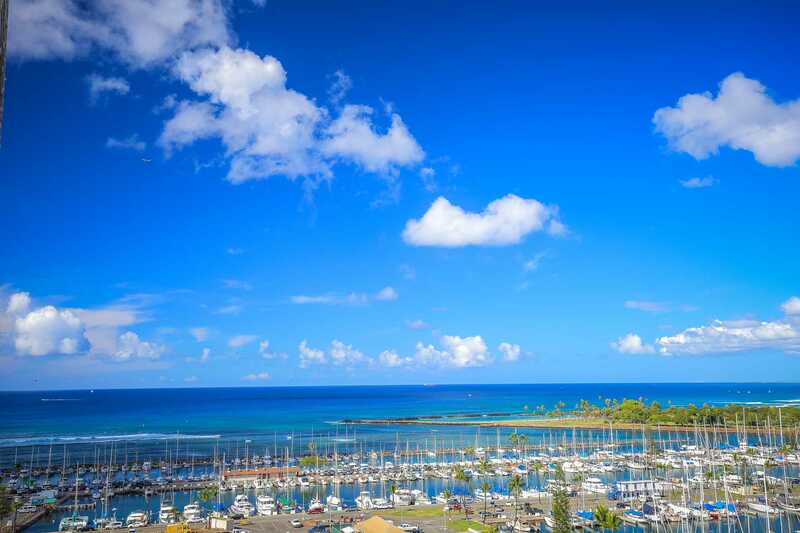 We will book through Hawaii Vacation Properties again in the future. We love Hawaii! 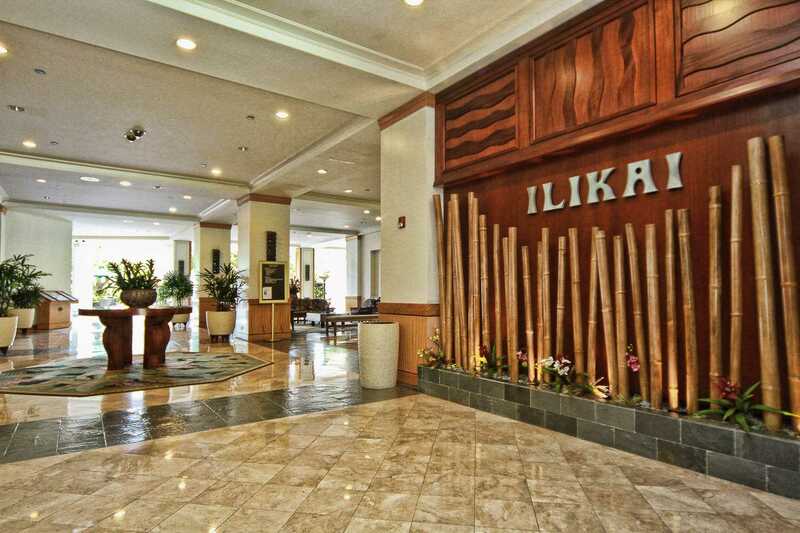 over the years we have stayed as a young couple in small hotels and now as a little family with a toddler, we returned for our second stay at the Ilikai. 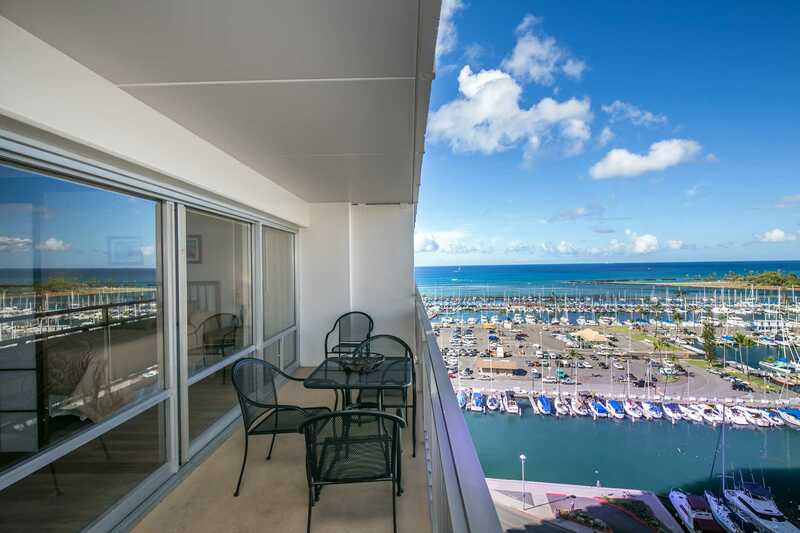 The location and format of the condo's make for a much easier stay in Oahu. The view can't be beat, and the rooms are quiet and well appointed. The kitchen is sizeable and the bathroom generous enough. The layout of 1333 is great. We were able to pull the screen across for the little one to sleep in the bedroom area in relative peace while we watched TV in the living room. 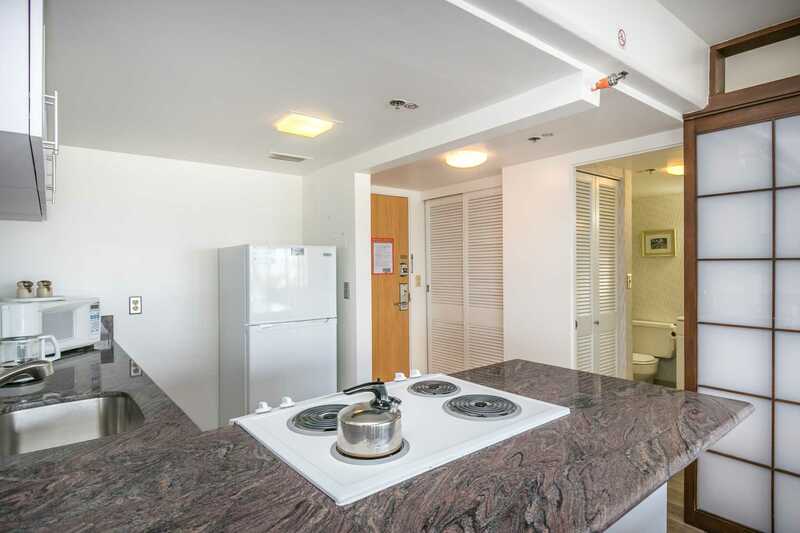 No dishwasher in the room, but otherwise the kitchen was well kitted out, - full size fridge and freezer, huge oven. A baking sheet would be useful for the oven for cooking pizza, etc. 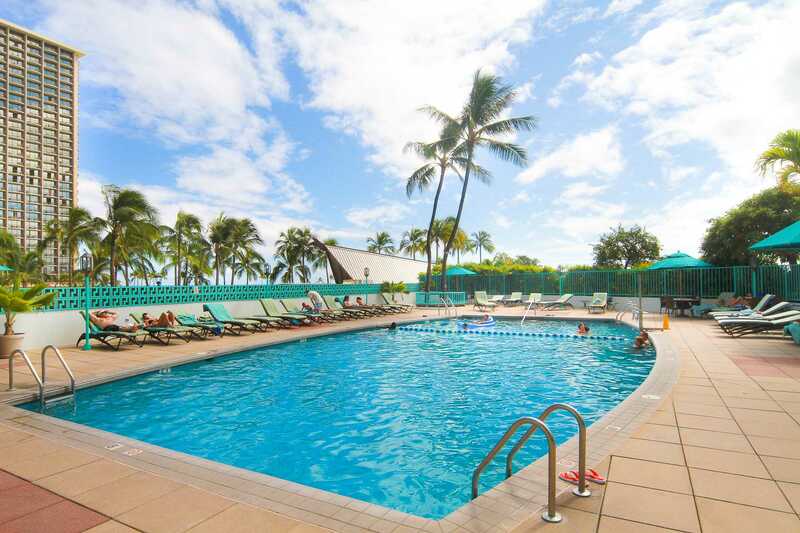 Short walk to the safe lagoon at the Hilton Hawaiian village for kids swimming or the fort de russy park etc. 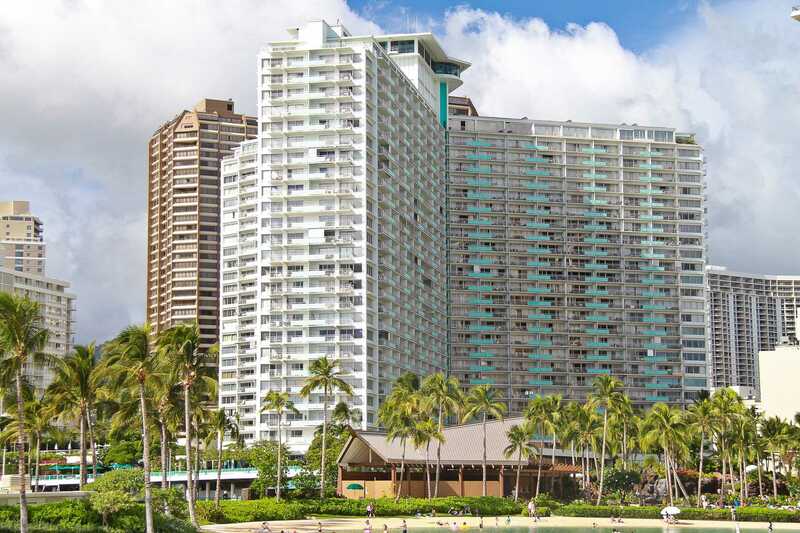 and a short walk to Ala Moana etc in one direction or Waikiki for meals, shopping etc. Still the best espresso coffee in the area downstairs at the Aroma Cafe too! Handy convenience store and restaurant downstairs too. We'll be back. Mahalo! We stayed from June 22 until June 26. The room was beautiful and just like the photos. We really like the flooring and the decor. The view was excellent and the King bed was very very comfortable. Usually it takes a day or two to adjust to a bed, but this bed was fantastic. However, I can't say that for the flip down "futon type" couch. It has room for only one person and we brought our two kids. It's a beautiful lovely suite with everything you need and perfect for two adults and one child on the couch. Everything else was great. My only recommendation would be for the guest to have use of the fitness center. We would have really enjoyed that as we work out daily. Hope that when we return the fitness center will be available to all the guest. We had our first holiday in Honolulu & things couldn't have been better. The condo was fantastic! We had an incredible view from the large balcony, the king size bed was very comfortable. Everything worked & was clean & spacious. We enjoyed being within walking distance to just about everything. The check in & check out procedure was very friendly & easy. We had excellent customer service from beginning to end. 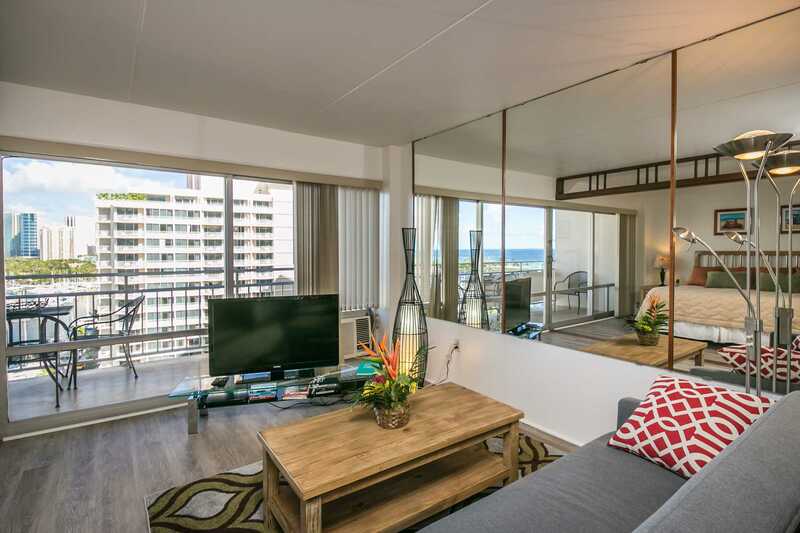 We are planning to return to Honolulu for another holiday next year & would love to be able to stay at condo 1333 again if it is available. We couldn't fault anything. 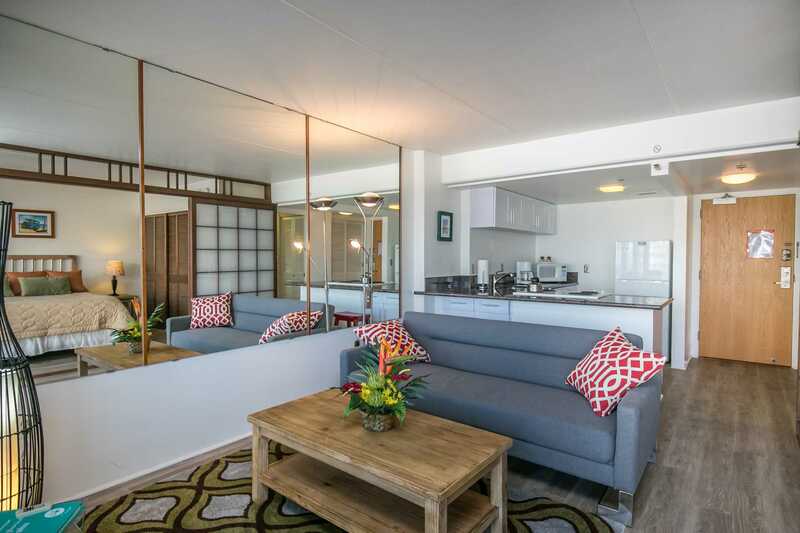 We found this condo to be in the perfect location, for all activities which included shopping, dining,swimming, surfing, & close to a number of great bars. 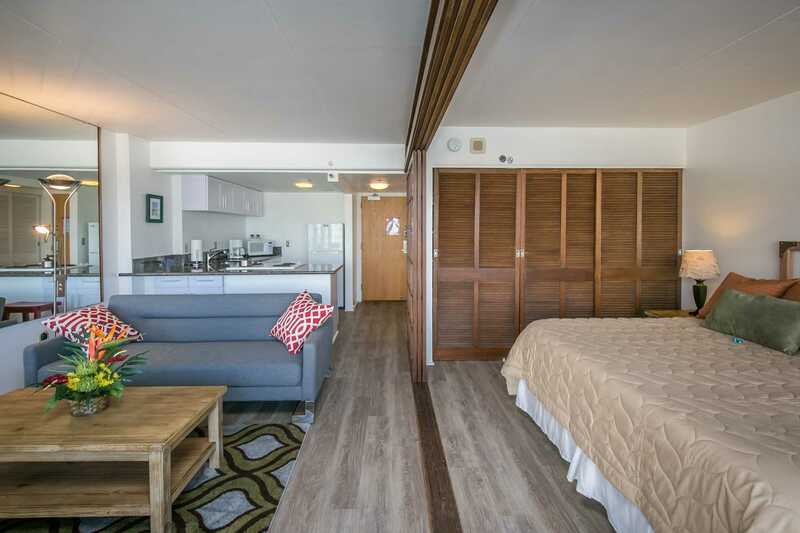 The unit was neat & tidy with good facilities & an awesome bed,with great views. 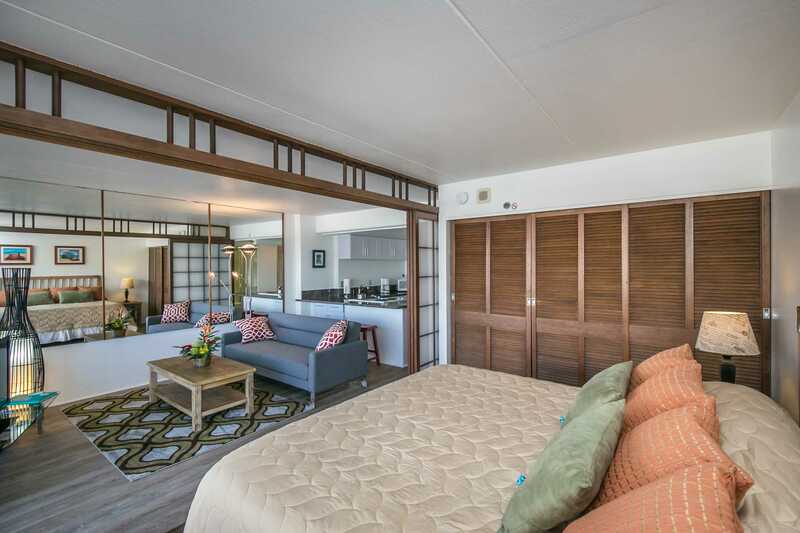 All our dealings with Hawaii Vacation Properties were excellent with the total package being as good as you could get, well done team. 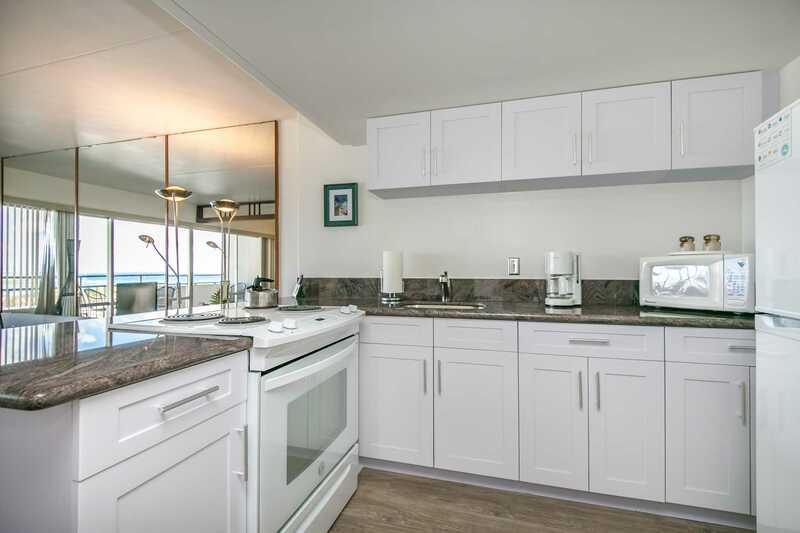 Very nice unit great view well appointed kitchen very comfy bed. We had a wonderful time and would stay in this unit again. 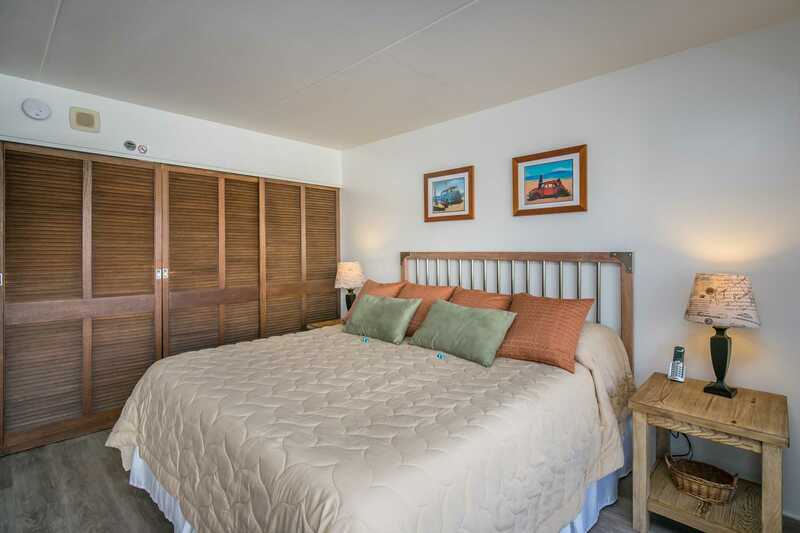 The only comment I have is the bathroom needs updating and the air conditioner.we really enjoyed working with Kat she pays attention to details we would recommend booking with her for a great vacation thank you.Kat and Debbie.